Between the hiking and boarding I have also done some “cultural” activities here in Nicaragua. The cockfight was a strange experience. We went to this Gallera place where many locals go to spend Sunday afternoon watching roosters fight. It really is a whole afternoon social activity. At a first glance it might seem a bit brutal and dumb, but after having the details explained I sort of understand. First of all a rooster here is a precious pet. Much more than a dog or a cat, which are nothing here. Most men treat their roosters very well. Feeding them the best crops, having them clean, having them at home. Roosters have to be trained for a year before they can fight. This means 1 hour of running a day and ocassional fight with rooster boxing gloves on (harmless excercise). 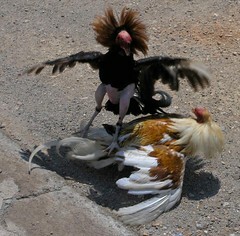 Roosters only fight twice a year (only if they survive the first fight obviously). All roosters have their nails cut off. For the fight they get a knife at the place where the fighting nail used to be (on the left leg only). These knives are standardized and both fighters get the same size in order for the fight to be fair. They do not necessarily fight till death. If both are standing after 15 minutes, it is a draw and nobody gets any money. If one falls and does not get up, the other rooster is not allowed to eat his eyes. Now, how super humane that is! All that being said, I only bet once on one rooster. He lost his life and I lost C$100. How unlucky (for him). Estelí is quite famous for its tobacco business. We went to this local cigar factory. They make more than 40 different cigars here, most of which are exported and cannot even be sold locally. Almost the whole process is manual. The most machinery is involved in creating the wooden boxes. For the cigars themselves, the leaves are selected manually, the cigars are rolled manually only using this manually operated folding tool, the packaging is done manually only using scissors and iron (same as for ironing clothes). The rolling itself is done by a woman and a man. Each couple makes 500 cigars a day. The structure of the cigar is that in the middle, there are strong a dry leaves, possibly with holes and other aesthetic imperfections. These are rolled by the man. Around it all is one leave “the wrapper”. This is dry, visually perfect, rolled by the woman. There is nothing special about Cuban cigars, except for they got good reputation, are illegal in US and cost way much more than other cigars. The Estelí factory is producing many different types of cigars, each tailored for a specific taste of target market. Strong taste for US, softer taste for Germany, smaller cigars for women (although, as our guide told us, some women like it big and I am not sure he was referring to cigars). I was seriously considering but missed on other “cultural” activities offered by local tourist agencies. Like making silver jewellery. Or like cooking iguana soup. The later one reportedly includes buying live iguana at the market and killing it with a dull knife. Yummy.